There was a time not too long ago (well, actually about three years ago now) when I thought waffles were better than pancakes. I can’t say that’s true anymore. Three years ago, I wrote a tribute to the waffle on National Waffle Day. Today, I’m going to turn the tables on that breakfast favorite (and myself) by giving you four reasons why pancakes are WAY better than waffles. 1. Pancakes were invented first. The cavemen didn’t have waffles, but they certainly did have pancakes – or, at least something strongly resembling the pancake. Neolithic man took the grains he harvested and turned them into a crude version of our current hotcakes by cooking the cakes on both sides with heated rocks. The waffle didn’t come into being until at least the time of the ancient Greeks, and even then it’s doubtful that what we consider to be waffles (i.,e., cooked with an actual waffle iron) came into being much earlier than the Middle Ages. Obviously, pancakes have time on their side. 2. The syrup and butter (and any other topping you want to use) can be evenly distributed over the pancake…not so much over the waffle. I can’t tell you how many times I’ve bitten into a waffle only to discover I have a mouth full of butter and/or syrup…and not much else. I’m not a fan of that fatty/sugary overload. I like those things to stay in their places…but in a figurative sense, as accompaniments to the main dish rather than something that overpowers the main dish. At some point or other, when you’re eating a waffle, you’re going to get a lot more in your mouth than waffle. That’s just not the case with pancakes. For this reason, pancakes are the culinary delight winners, in my book. 3. This reason is somewhat related to the previous one…Pancakes are STACKABLE! You can put two, three, or even more on top of each other…and you can pile on the toppings in between each layer. Talk about a party in your mouth! Have you ever tried to stack waffles? Just look at the picture above. You’re never going to get the same level of complete one-to-one cohesion as you do when you’re talking about a pancake stack. In this case, pancakes win for sheer volume and culinary aesthetic possibilities. 4. You don’t need any special tool to make a pancake. I use mix and a skillet. For really good waffles, you’re going to need a really good waffle iron, like this one. And while we’re on the subject of waffle irons, have you ever tried to clean one of these things? What a pain! When you’re making pancakes, there’s really very little cleanup involved. Most of the time (if you oil the pan well enough), you don’t have anything left on the pan after the pancake is done. I can’t say the same for any waffle I’ve ever made. When it comes to ease and convenience, pancakes, again, are the hands-down winners. So, hopefully I’ve made a convincing case for this culinary treasure. What do you think? 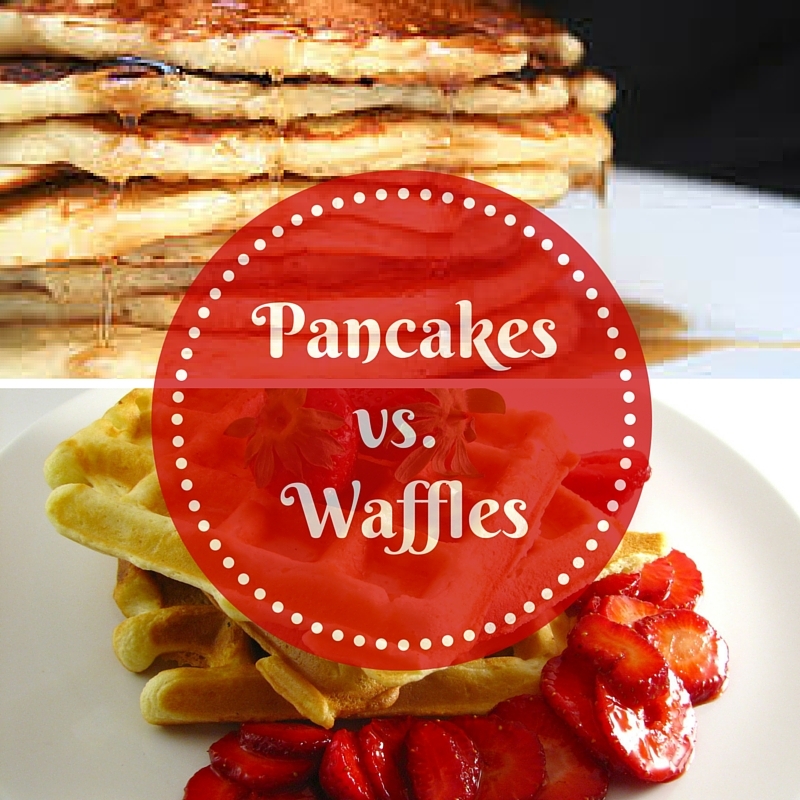 Which one is your favorite – the waffle or the pancake? I’d love for you to tell me why in the comments! Previous I Can’t Live Without This Sandwich Maker!